A late winner from on-loan Hibs striker Leigh Griffiths gave Hibs victory over Aberdeen and kept alive their dream of ending a 110-year wait to win the Scottish Cup. The semi-final looked set for extra-time to determine a winner, but boyhood Hibs fan Griffiths struck five minutes from time to secure a final spot for the Leith men. It was Hibs’ first win over Aberdeen in five meetings and it delivered more cup misery on the Pittodrie side, who had not won at Hampden for 12 years. With Lewis Stevenson suspended, Hibs manager Pat Fenlon brought Honduran Jorge Claros into midfield as he looked to build on two unbeaten games that had eased their SPL relegation fears. The Dons were without cup-tied midfielder Gavin Rae and manager Craig Brown went with the physical presence of Rory Fallon up front instead of the pace provided by Darren Mackie. Kari Arnason also came into the starting line-up but the midfielder, who had impressed all season for the Dons, was found wanting as Hibs went ahead after a lively start. The Icelander stood motionless as the ball broke to striker Garry O’Connor after an Isaiah Osbourne drive was charged down. When Mark Reynolds blocked Griffiths’s shot and the ball broke wide for Pa Kujabi, Arnason and Andrew Considine both failed to pick up O’Connor and the striker steered home after just three minutes. It was a poor bit of defending all round, with keeper Jason Brown failing to cover the near post with his body, although television replays suggested O’Connor had been offside in the build-up. Few goals had been expected with the three league meetings between the sides prior to this encounter having produced just one goal – and that had been a controversial penalty scored by Dons striker Scott Vernon. Hibs were first to the loose balls and, when captain James McPake stepped out of defence to find Griffiths with a pass through the centre, the striker sent a 20-yard drive just wide of Brown’s left-hand post. The Dons had more possession and there were muted claims for a penalty when Considine was clipped by Paul Hanlon following a corner, but generally they were laboured in their build up and Hibs looked comfortable protecting their one-goal lead. Aberdeen boss Brown made a switch at half-time, bringing on Fraser Fyvie for fellow Scotland Under-21 midfielder Ryan Jack. The Dons immediately looked more lively and Considine sent a powerful 15-yard header straight at goalkeeper Graham Stack, their first shot on target coming from Stephen Hughes’s curling free-kick. Following their first chance Aberdeen enjoyed their best spell of the match and only required a finishing touch to convert their possession into goals. That touch was provided in the 58th minute as Fallon controlled the ball on his chest 25 yards from goal before looping a volley over Stack’s head. 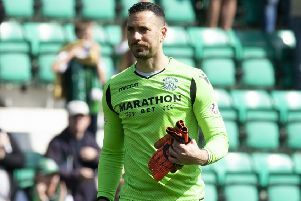 Hibs were dealt a blow when Stack had to be replaced with Mark Brown after 72 minutes as the keeper picked up a leg injury and his replacement was tested almost instantly by a low drive from Dons substitute Mackie. For all Aberdeen’s passing and probing after equalising the best chance to take the lead fell to Griffiths whose shot hit the outside of the post after fine link up play with O’Connor. That partnership combined again five minutes from time as O’Connor steered a perfect pass to Griffiths who made no mistake this time as he escaped his marker and fired a clinical finish into the bottom left corner.